Meeting deadlines, fulfilling expectations and balancing the impossible is how an average day passes in this crazy world. But for Nina Lekhi and her team of employees at Baggit, life takes a deep breath every afternoon! 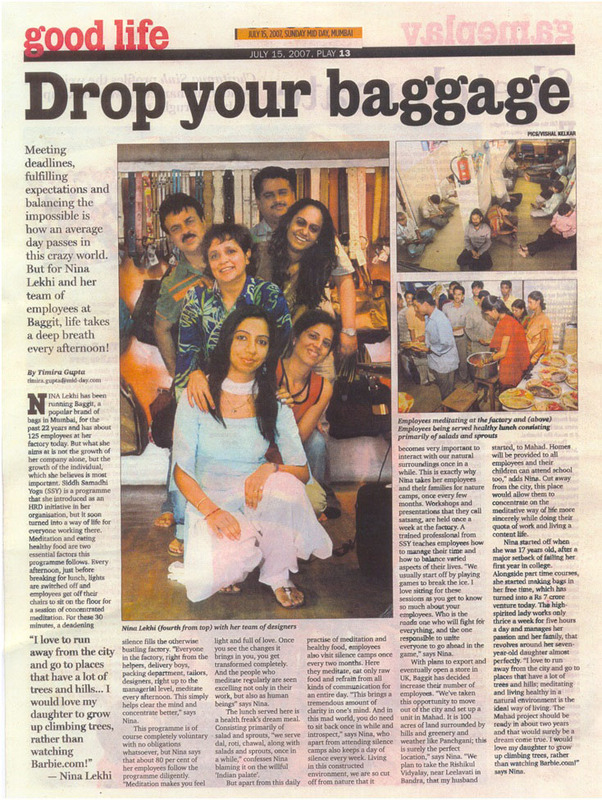 Nina Lekhi has been running Baggit, a popular brand of bags in Mumbai, for the past 22 years and has about 125 employees at her factory today. But what she aims at is not the growth of her company alone, but the growth of individual which she believes is most important. Siddha Samadhi Yoga (SSY) is a programme that she introduced as an HRD initiative in her organization, but it soon turned into a way of life for everyone working there. Meditation and eating healthy food are two essential factors that this programme follows. Every afternoon, just before breaking for lunch, lights are switched off and employees get off their chairs to sit on floor for a session of concentrated meditation. For these 30 minutes, a deadening silence fills the otherwise bustling factory. “Everyone in the factory, right from the helpers, delivery boys, packing department,tailors, designers, right up to the managerial level, meditate every afternoon. This simply helps clear the mind and concentrate better,” says Nina. The programme is of course completely voluntarywith no obligations whatsoever, but Nina says that about 80 per cent of her employees follow the programme diligently. “Meditation makes you feel light and full of love. Once you see the changes it brings in you, you get transformed completely. And the people who meditate regularly are seen excelling not only in their work but also as human beings” says Nina. The lunch served here is a health freak’s dream meal. Consisting primarily of salads and sprouts, “We serve dal, roti, chawal along with salads, once in a while,” confesses Nina blaming it on the willful ‘Indian palate’. But apart from this daily practice of meditation and healthy food, employees also visit silence camps once every two months. Here they meditate, eat only raw food; refrain from all kinds of communication for an entire day. 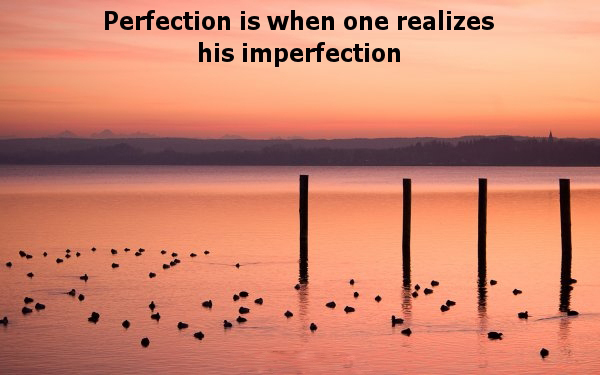 “This brings a tremendous amount of clarity in one’s mind. And in this mad world, you do need to sit back once in a while and introspect.” says Nina, who apart from attending silence camps also keeps a day of silence every week. Living in this constructed environment, we are so cut off from nature that it becomes very important to interact with our natural surroundings once in a while. This is exactly why Nina takes her employees and their families for nature camps, once every few months. Workshops and presentations that they call satsang, are held once in a week at the factory. A trained professional from SSY teaches employees how to manage their time and how to balance varied aspects of their lives. “We usually start off by playing games to break the ice. I love sitting for these sessions as you get to know so much about your employees. Who is the tough one who will fight for everything, and the one responsible to unite everyone to go ahead in the game,” says Nina. With plans to export and eventually open a store in UK, Baggit has decided to increase their number of the employees. “We’ve taken this opportunity to move out of the city and set up a unit in Mahad. It is 100 acres of land surrounded by hills and greenery and weather like Panchgani; this is surely the perfect location,” Says Nina, “We plan to set up something similar to the Rishikul Vidyalaya, a school near Leelavati hospital in Bandra, that my husband initiated along withMumbai Educational Trust, at Mahad. Homes will be provided to all employees and their children can attend school too,” adds Nina. Cut away from the city, this place would allow them to concentrate on the meditative way of life more sincerely while doing their quota of work and living a content life. Nina started off when she was 17 years old, after a major setback of failing her first year in college. Alongside part time courses, she started making bags in her free time, which has turned into a Rs. 7 crore venture today. The high spirited lady works only thrice a week for five hours a day and manages her family, that revolves around her seven year old daughter almost perfectly. “I love to run away from the city and go to places that have lot of trees and hills, meditating and living healthy in natural environment is the ideal way of living. The Mahad project should be ready in about two years and that would surely be a dream comes true. I would love my daughter to grow up climbing trees, rather than watching Barbie.com! ” says Nina.